My visit was scheduled on a national holiday (Health-Sports Day held on second Monday of October), which unfortunately meant few children were there during my visit. When I went to view the school's Friendship Doll in the morning, I was surprised to find that I was accompanied by about 20 people, including persons from two newspapers and a local TV station. The principal kindly invited me to return on a regular school day to meet the students. Shimabara Daiichi Elementary School's doll, Little Mary, is prominently displayed in a special room with tatami mats that is across a walkway from the main school building. This doll from America participated in a welcoming ceremony held on May 18, 1927, for the four Friendship Dolls distributed to schools in Shimabara. A large photo of this welcome ceremony is hung below the display case for Little Mary. The four American dolls in the photo are surrounded by numerous Japanese dolls there to greet them. 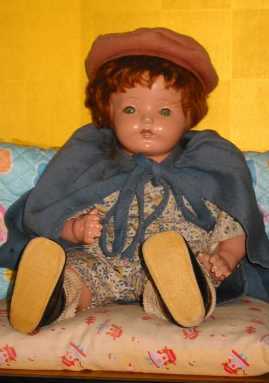 Little Mary was discovered at the school in 1984. For many years the doll did not have a name, since the original passport with the name has never been found. A couple of years ago the students at the school decided to give the doll the name of "Little Mary," which is the title of the English translation of a children's book written by Eiko Takeda, who has researched the Friendship Dolls for many years and has written several books about them. 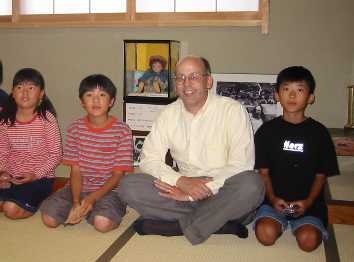 When talking with the few children who came that morning, I was surprised when I saw a non-Japanese woman there. I found out later that she is the English teacher at Shimabara Daiichi Elementary School and two other elementary schools in the city of Shimabara. She has lived for several years in Shimabara, and she has about 1,000 students to whom she gives English instruction. I appreciate the support and encouragement of the members of the Miss Nagasaki Homecoming Committee in helping to arrange my visit to Shimabara. Several Shimabara residents are working enthusiastically to plan for the April 2003 homecoming exhibition of Miss Nagasaki, the Japanese Friendship Doll at the Rochester Museum & Science Center in New York. On the Sunday night before my school visit, there was a public meeting attended by many of the people involved with Miss Nagasaki's homecoming. At the meeting Hirobumi Toyama, a retired English teacher in Nagasaki City who has researched the Friendship Dolls for about 20 years, and I gave talks about the Friendship Dolls. 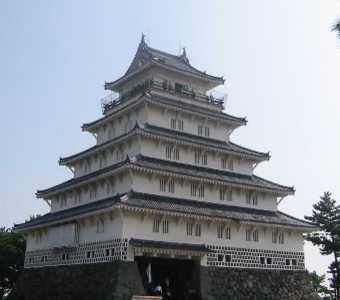 After the visit to the school, a local couple showed me several of the sites of Shimabara, including the castle, a street of old Samurai hours, and a historical museum. As I walked around the city, I was surprised by the natural water gushing out in many places and available for the public to drink. Since the day was rather hot, I took advantage of the delicious water from the ground four or five times. Later we went a short distance from the center of the city to view an area devastated in the early 1990s by eruptions from the Unzen Volcano and by the debris flows caused by subsequent rainstorms. The volcano caused 44 deaths and destroyed hundreds of houses.